Yunnan Pu-erh Tea is renowned as slimming tea. 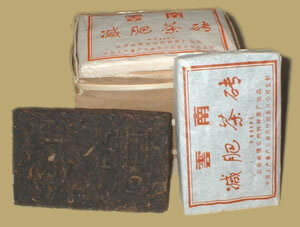 This rectangular Pu-erh brick weighs about 250 grams each, four bricks stack. The Chinese characters for "Weight Loss" are raised on one side, It has an agreeable mellow character and an earthy flavor that is common to Pu-erh tea.